Great tour by a very knowledgeable guide. TbyL has been our "go to" for getting our bearing when visiting a new city and Elisabeth continued to reinforce the high standards we've come to expect from TbyL private guides. Her 3-hour Vienna tour provided a fantastic orientation of the old town and as we were visiting during the holiday season, we even got to sample around 5 different Christmas markets too. Her excellent English and thorough knowledge of history helped bring the city to life. I wouldn't hesitate to recommend her to any visitor. Our family had a great day exploring Vienna with Elisabeth. She is very knowledgeable and entertaining. We highly recommend Elisabeth for your next tour. We so enjoyed our full day tour with Elisabeth. I would rate it a 5 out of 5 in every category. She was so knowledgeable about art, history and the general city. Very helpful and flexible with our group of five. Would definitely book her again! Elisabeth was wonderful catering our tour with our older parents to be enjoyable by all by offering places to sit and rest in between sites and the lunch and coffee house was great!!! Elisabeth is very knowledgeable and professional. I highly recommend her. Being extremely extremely ill, our tour guide was so understanding and so kind to us. We were grateful for her understanding. Her knowledge is of great value. 5 plus. TOUR GUIDE RESPONSE: Thank you for your remarks as any suggestion how to improve is welcome. I am sorry that you expected more Christmas atmosphere at the Vienna Woods. Definitely this is not an alpine region like Tyrol or Salzburg that could have met your expectations better. What could be done was done. Yes, I am not a native speaker. It can be, that my English is not 100% perfect. Elisabeth was a wonderful guide and really showed us a lot of Vienna in 3 hours. She was very knowledgeable about the history of this beautiful city and was willing to share wonderful stories about her life in Vienna as well. Highly recommend this tour if you are limited to only a day in Vienna. We spent a lovely day with Elisabeth! She was so knowledgeable and friendly and very accommodating to what our needs and interests were. I would highly recommend her as a guide and would definitely book with her again. Our driver, Hannes, was also wonderful and skillfully transported us in a clean and comfortable vehicle. Elisabeth was a fantastic tour guide. Her knowledge of every place we visited was excellent. We had one person with MS and another that was 85 and Elisabeth understood our needs and adjusted the tour pace perfectly to fit our party. I would strongly recommend Elisabeth for anyone wanting to take a private tour around Vienna. Thank you Elisabeth! Elisabeth met us and left us promptly at the airport. She was an excellent, showing us the city's architecture. She was very knowledgeable about each stop we made, giving us historic background and current events of the city. Our driver, Hans was an experienced and safe driver. We will be back! Elizabeth did a great job of showing us the highlights of Vienna. She gave us interesting historical and informative information on the venues we saw. I would highly recommend her as a guide. Elisabeth is an excellent tour guide. She knows her history. She is very pleasant and accommodating. I would absolutely recommend her. Best TBL tour we've ever had. 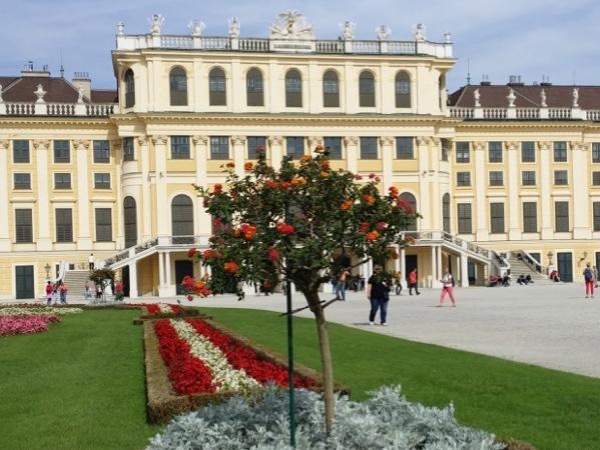 Elisabeth was extremely knowledgeable about Vienna and Austrian history. However, the best part of the tour was her openness about the past and our frank discussions of Austria's involvement in WWII. Our discussions were frank, honest, and open. No sugar-coating of roles and Austria's role. She is not only a tour guide, but an unbiased historian. Excellent overview of the old and new city of Vienna, partly by private van and on foot. Knowledgeable guide, friendly, enthousiast, adaptive to circumstances and interests of her guests. We would really recommend her ! As we hoped, we saw parts of Vienna that we would not otherwise have found; and charming they were too. Elizabeth was punctual, well-informed, sensitive to the different walking speeds of our small party and spoke excellent English. She was also splendid company. Intelligent, personable, and informative tour guide. Our eight hour tour went all too quickly. Family had a great time with Elisabeth. She did a nice job showing us around and giving us an appropriate amount of information for out kids to keep their interest. The tour was a nice combination of sites. The lunch in the cellar was a great stop for lunch and also enjoyed the coffee/cake. The tour was very well prepared and coordinated.